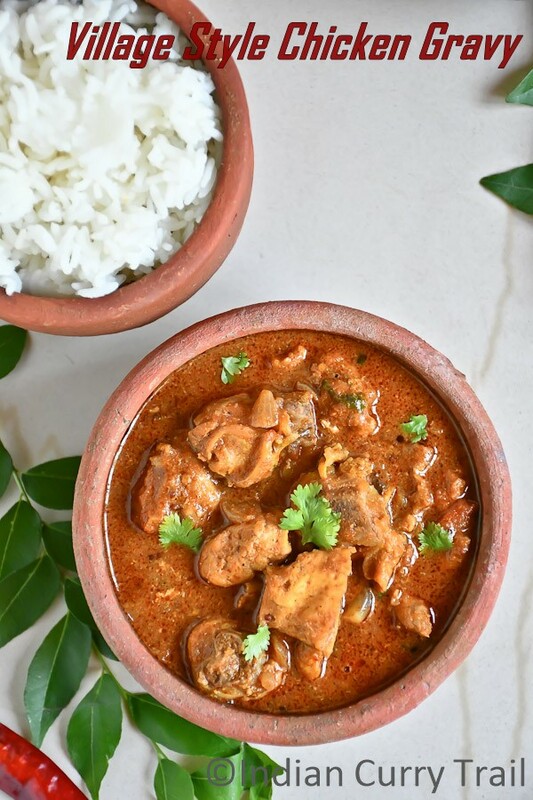 Village Style Chicken Gravy is one of the very old and flavorful chicken gravies from Indian Curry Trail that uses freshly ground masala. 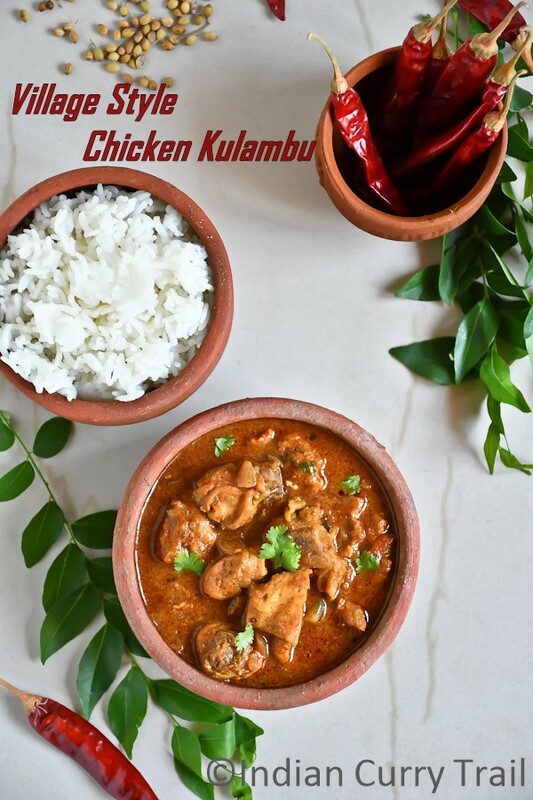 This Chicken Kulambu tastes delicious when cooked using Nattu Kozhi. The masala can be ground in advance and can be used in gravy instantly. You may also add potato along with chicken pieces. This gravy doesn't need ginger garlic paste. 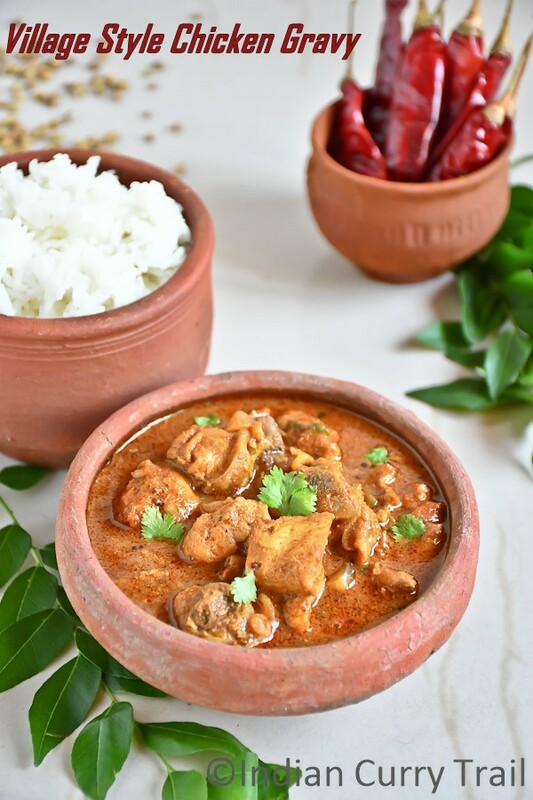 The masala itself gives you the wonderful flavor which will linger in your taste buds for a long time. The recipe video is given below. Please like, share and subscribe and show your love. Here is my channel link - Indian Curry Trail. 1) Clean the chicken pieces and take it in a bowl. 2) Add turmeric powder, pepper powder and salt. 3) Mix well, cover using a lid and keep aside. 1) Take a pan and heat a teaspoon of oil in it. 2) Add all the ingredients as above mentioned for Masala except poppy seeds. 3) Roast them well. Before turning it off, add the poppy seeds and roast again. 4) Turn off the flame after you sense good aroma coming from it while roasting. 5) Allow the contents to cool. Once the masala mixture cools down, grind it to a powder. 1) Heat oil in a wide pan. 2) When it is hot, add the mustard seeds and curry leaves. let it splutter. 3) Add the onion and saute well till it becomes soft. 4) Add the tomato and cook till the tomato pieces completely mashes. 5) Add the chicken pieces. Mix well. Cover using the lid and cook. 6) No need to add water now. The chicken itself, leaves out water while cooking. 7) Once the chicken almost cooked, add the ground masala and 1 to 1/2 cups of water. Adjust the water quantity according to the required consistency. 8) Let the gravy boil till the oil oozes out from it. 9) Garnish with coriander leaves and turn off the flame. 10) Serve hot with steamed rice. Serve this gravy as a side dish for Hot steamed rice. It also goes very well as a dish dish with Dosa and Roti (Indian flat bread). 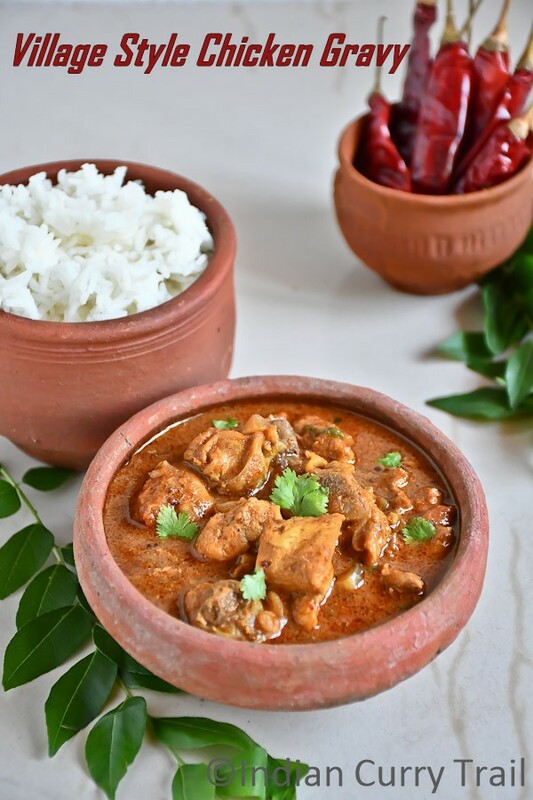 1) The masala can be prepared well in advance for this gravy. However, the freshly ground masala would give wonderful flavor. 2) You can also pressure cook the chicken before adding to the gravy. 3) Adjust the salt at the end, if needed.